Étienne-Jules Marey - middle of the XIXth century – one of the first who wrote the sanguine pulse into a cryptic language using a wooden primitive device – the body becomes a limit and the limit becomes a graphic concatenation of signs. 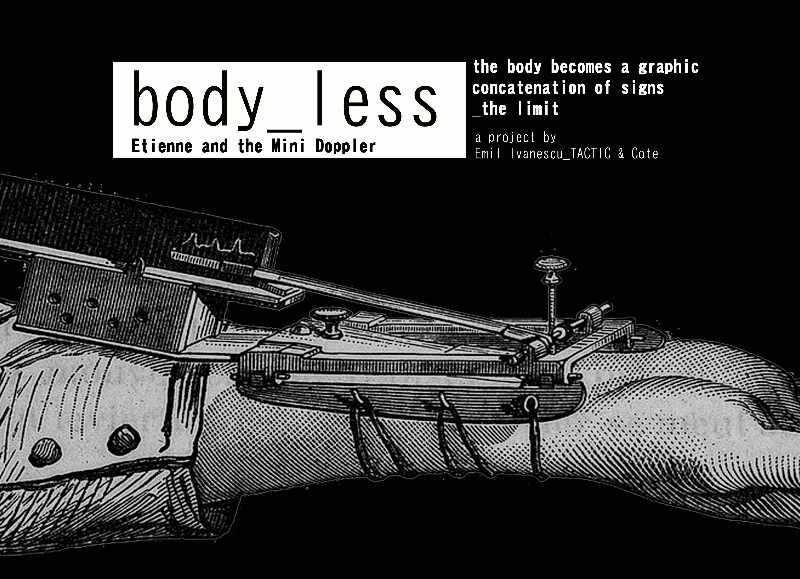 Body_less - the beginning of the XXIst century – the visceral body becomes a sound and the sound becomes an interactive electronic sign and space – a Doppler room/installation capturing the somatic response of the visitors’ body. I am interested especially in the way in which different sensations of the body can be recorded, analyzed and translated spatially. I am interested in different technologies (especially medical) through which the anatomical-physiological reality is captured and quantified. I am interested to reshape this resultant material in space.